The newest and most delicious (if I may say!) superfood! These sustainably harvested, premium California Cabernet Sauvignon wine grapes are picked at the peak of ripeness before being dried on the vine. This unique drying process allows the stem to act as a cork for each individual berry sealing in the delicious flavor and critical nutrients. 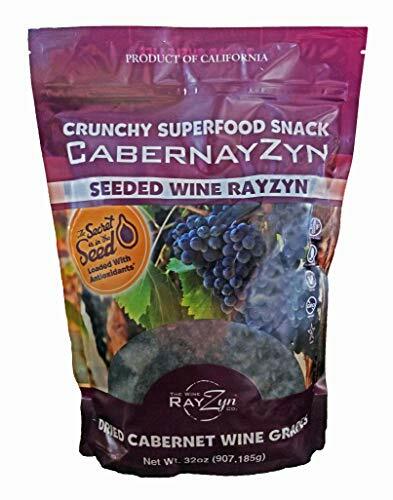 We've all heard of the health benefits that red wine provides, with CabernayZyns you get even more antioxidants, polyphenols, fiber and bioavailable nutrients without the alcohol so your whole family can enjoy! They are a delicious sweet and crunchy treat by themselves or as a part of a salad, cheese board, trail mix or anything else you can think of. If you have any questions about this product by RayZyn, contact us by completing and submitting the form below. If you are looking for a specif part number, please include it with your message. Sun-Maid California Raisins, 4 lbs. Sun Maid Natural California Raisins, Pack of 2 x 13 Oz.